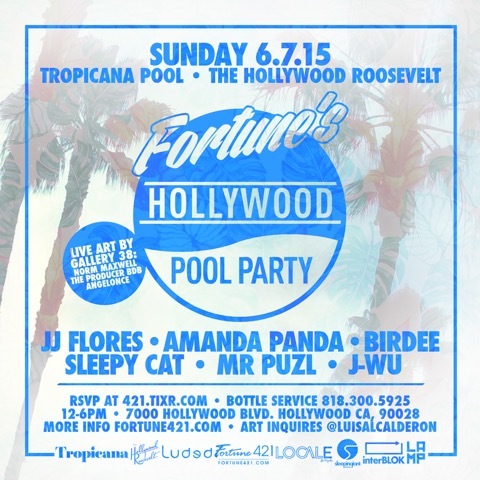 Gallery 38 is set to take over Fortune’s Hollywood Pool Party with live art as well as a pop-up gallery for you and 700 of your closest friends. Norm “Nomzee” Maxwell (born 1969) is an American Contemporary Artist living and working in Los Angeles. His work is a commentary on social issues concerning Politics, Religion, Mythology, Popular and Urban Culture. Maxwell’s signature style references a broad range of genres, merging traditional techniques with his graffiti-esque aesthetic to create a rich and diverse visual language that is uniquely his own. The Producer BDB (Born Bryan Avila , Riverside, CA), is a Contemporary artist, primarily recognized for his street art. He creates images that blend Pop Icons with current fashion trends. His distinct style merges elements of street, pop, fashion and fine art. His street art has been showcased accross the world in the streets of Rio De Janerio, Madrid, Paris, Miami, Berlin and Los Angeles where he lives.